Adler's insightful new POWER hiring methods enable managers to attract, assess, and recruit the best candidates through the integration of online tools and offline behavior modifications. New information on hiring and the Internet, diversity, and legal compliance issues is included. LOU ADLER is founder and President of POWER Hiring(r) a consulting and training company, and of CJA-The Adler Group, an executive search firm based in southern California. His commonsense POWER Hiring(r) techniques are used by such companies as Verizon, Texas Instruments, the YMCA, Tricon, and Cardinal Health, among others. Chapter 1: The POWER Hiring Approach to Hiring Top Talent. Chapter 2: Performance Profiles-Define Success, Not Skills. Chapter 4: The Basic Four-Question Interview. Chapter 5: Work-Type Profiling: Matching Skills and Interests with Job Needs. Chapter 6: After the First Interview-How to Make Sure You Have a Great Candidate. Chapter 7: The Ten-Factor Candidate Assessment. Chapter 8: Recruiting, Negotiating, and Closing. Chapter 9: Sourcing-How to Find the Best. 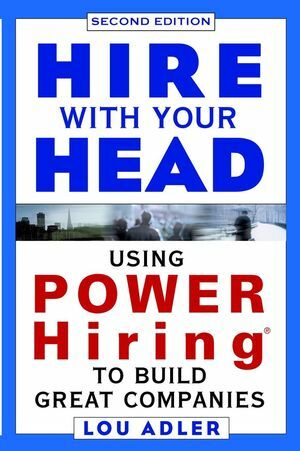 Chapter 10: Implementing POWER Hiring. Appendix A: The Legality of the POWER Hiring Protocol (Robert J. Bekken). Appendix B: A Discussion of the Validity of the Structured Interviews Used in the POWER Hiring Process (Charles A. Handler, PhD). 3. The Basic Eight-Question Interview. 4. The Ten-Factor Candidate Assessment.